2017 IRS Annual Filing Season Program (AFSP) courses are now available at Kian Finance Authority. Earn your Record of Completion before applying for PTIN! Our 18-hour AFSP includes everything you need to earn your Record of Completion! Plus 3 hours of Exam time: continuous exam time administered on-site on a separate date. 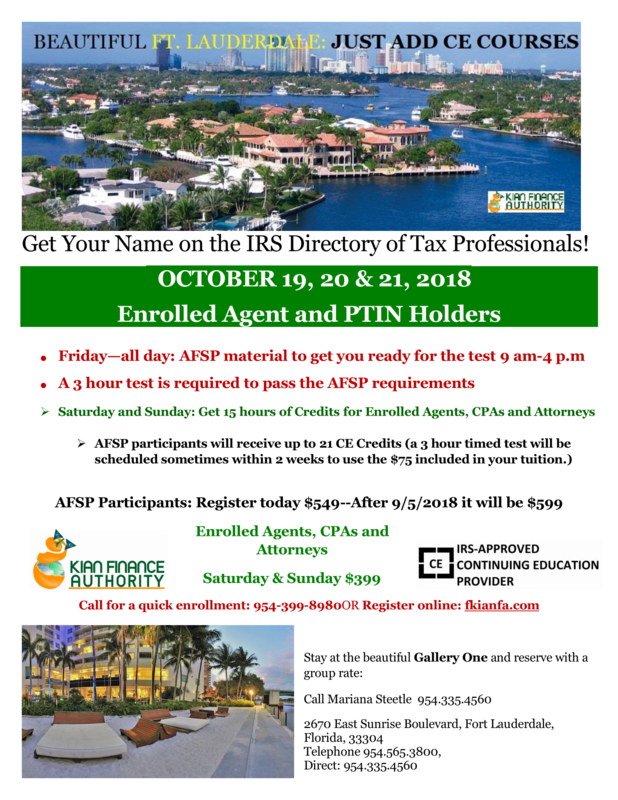 If you’re already a credentialed or enrolled preparer, or you have passed the Registered Tax Return Preparer exam, Part 1 of the Special Enrollment Examination (SEE) you can earn the AFSP Record of Completion by completing our 8-hour AFSP Bundle for Credentialed Preparers, which is now available for 15 hours only at $399. For evening workshop availability, please call 954-399-8980 to register. Register for yearly required Continuing Education courses where you can ask questions about the topics.